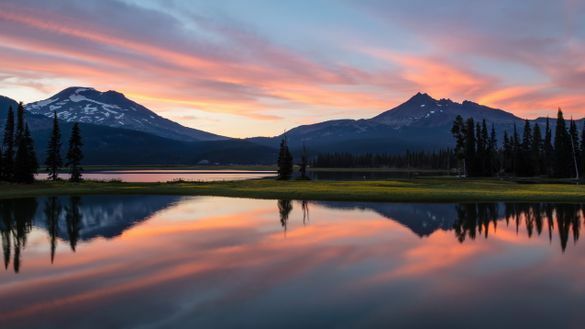 SwimTrek is expanding is US trip offerings with the launch of its brand-new trip, the Cascade Lakes – Oregon. The long-established swimming holiday company has launched its new trip in the heart of the Cascade Lakes region in some of Oregon’s most beautiful National Forests. Featuring an impressive mix of stunning swims, hikes and beautiful landscapes, this provides a perfect shorter getaway for an avid SwimTrekker seeking a combination of physical activities and naturally beautiful backdrops. The base for the week is the Elk Lake Resort, a destination for local nature lovers with traditional, rustic accommodation set on the banks of its namesake body of water. Elk Lake is a hive for all types of sports throughout summer and winter, as well as a thriving environment for local wildlife, with the lake earning its name from the large numbers of elk that formerly frequented its shores. The resort offers the opportunity to stay in the own log cabins, enjoy recreational activities year-round and hearty local cooking in its on-site restaurant. The adventure all takes place in Oregon’s Cascade Range region, in the shadow of the striking Mount Bachelor. A trip that embraces the best of the stunning Oregon countryside awaits. The swims will include crossings of several lakes and shoreline swims through the Deschutes National Forest as well a mix of hikes around the National Forest volcanic peaks. These include trails along the Quinn Creek and the Cascade Lakes National Scenic Byway. The open landscapes and cool refreshing waters set this trip apart for its stunning mix of enclosed forests and open vistas. The breath-taking views provide the perfect backdrop for a lunch stop or a quick hike break. The trip offers rustic accommodation in traditional log cabins that have a chalet style feel. There is a sense of community and cosiness that comes with an escape to these cabin getaways that fosters a great sense of friendship between you and your fellow guests. A trip like this allows for ample bonding time with your new friends on the cabin verandas over a hot drink or a cool beer. SwimTrek is running its Cascade Lakes – Oregon Trips in September 2018. Prices start from £1,690 ($2,409.90) for a twin cabin. Packages include guide lead tours, full safety vessel cover, accommodation and all meals. Full trip details can be found on our website at https://www.swimtrek.com/packages/swimming-holiday-cascade-lakes-oregon or by calling the SwimTrek Customer Team on 01273 739713. For further information and photo requests, please contact georgie@swimtrek.com. SwimTrek are the market leaders and pioneers of open water swimming. Launched in 2003, SwimTrek has grown from a select pick of locations in the Mediterranean and the British Isles to running trips across Europe and constantly expanding to include destinations such as the Middle East, The Caribbean and Africa. It continues to be the world’s leading open-water swimming specialist and welcomes all levels of open-water swimmers and uses highly trained guides and expert local pilots. Committed to treks with a purpose, a SwimTrek holiday is guaranteed to be steeped in history and set in stunning locations. SwimTrek also produces swim events, swim coaching & bespoke open water experiences.